Dr. Steven Feit wants our patients to always have a pleasurable experience whenever they come to see us. 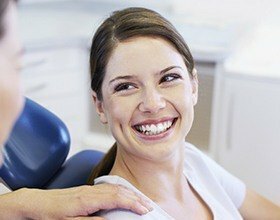 Beyond giving them a beautiful and healthy smile, he wants to provide easy and stress-free appointments that leave people feeling refreshed and renewed. In order to accomplish this, he has invested in some of the latest dental technology available today. Thanks to our state-of-the-art facility, you’ll float through your appointments like you’re on a lazy river, and at the end, a gorgeous smile will be waiting for you. X-rays are an essential tool in our practice as they help us find and diagnose dental problems as early as possible, often before they are even visible to the naked eye. At our practice, we only use 100% digital X-rays because they are much faster and cleaner than traditional, film-based ones. They don’t require toxic darkroom chemicals to be developed, plus they reduce radiation exposure by up to 80%, giving many of our patients peace of mind. If you hate needles, then you’ll love The Dental Vibe™. Fear of needles keeps many patients away from needed dental care. This ultimately results in making the problem worse and can lead to serious dental issues. 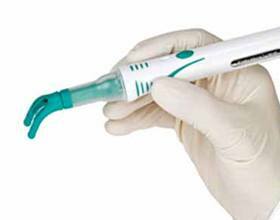 The Dental Vibe™ lightly vibrates the gum tissue around the injection site while the numbing injections are administered. This vibration feeling reaches the brain first and essentially blocks the feel of the injection from being perceived. 95% of the patients that have experienced the Dental Vibe™ Comfort System say that it changed their feelings about dental procedures. Basically, it helps you feel nothing right before you feel nothing! We’re proud to say that we have an office with many of the comforts of home. Whether you’re coming or going, you’ll have the chance to choose a beverage from our coffee bar, and during your appointment, you’ll be provided with a warm towel to help any nerves or stress melt away. Our treatment rooms even have TVs on the wall and ceiling so you can get lost in a program during your appointment, helping your time fly by even faster. If you experience mild to moderate dental phobia, our team is ready to help calm your nerves with oral conscious sedation. 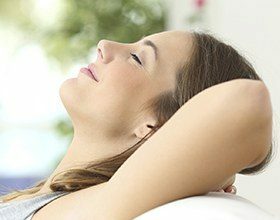 We can prescribe you a pill to take about an hour before your scheduled procedure, so that by the time you actually reach our office and sit in the chair, you’ll already be physically and mentally relaxed. Under this sedation, you’ll remain awake the entire time, but your visit will seem to fly by very quickly, and you’ll likely have little to no memory of it afterward. Your TMJ, or temporomandibular joint, is the small set of hinges that enables your jaw to move in all directions, giving you the ability to eat, speak, laugh, and yawn. Like other joints in the body, the TMJ can sometimes become strained or inflamed, leading to what is called a TMJ disorder, or TMD. Symptoms can include jaw pain and stiffness, chronic headaches, and even nighttime teeth grinding! Fortunately, Dr. Feit is able to diagnose and treat these issues right in our Boca Raton office.